By Ralph Rio, vice president, ARC Advisory Group. Today, many equipment manufacturers are reclaiming the service relationship from the distribution channels with a modern field service management system and remote monitoring. Adding IoT to their products provides the infrastructure for predictive maintenance and proactive service. Rather than react to emergency calls and disgruntled customers, they know when the equipment’s health is deteriorating and can make the repair prior to failure. Service providers are also starting to provide a similar digital transformation by enhancing their service agreements with add-on components for remote monitoring and predictive maintenance. IoT with predictive maintenance is beginning to transform field service from a reactive cost centre into a proactive business with higher revenue and margins. Unplanned downtime is particularly painful with lost revenues, missed customer shipments, quality issues, and safety or environmental incidents. By nearly eliminating unplanned downtime, customer satisfaction, net promoter score and repeat orders increase. With modern field service management (FSM) and IoT-connected products, field services owner-operators can improve their asset availability and performance and technology suppliers can gain a competitive advantage with increased revenues for both products and services. • Lost revenues with lower profitability since the equipment is not available when needed to make product. • Missed shipments and lower customer satisfaction. • Safety and environmental incidents. • Scrap materials, quality issues and rework resulting in production delays. • Lost hours waiting for a repair. • Extra equipment for back-up. • More internal, on-site maintenance staff. • Increased reliability and maintenance engineering. • Increased work in progress (WIP) inventory so downstream operations can continue during a failure and repair. • Increased finished goods inventory to help avoid lost revenues and missed shipments. Many of these costs have become thought of as necessary for a well-run business, or even considered a ‘best practice.’ However, in the context of lean manufacturing, they are non-value-added waste that should be eliminated. For preventive maintenance, reliability engineers examine an asset’s failure history and schedule maintenance based on usage using either time duration or number of cycles. The strategy for preventive maintenance is to schedule work orders just before the frequency of failure starts to increase. 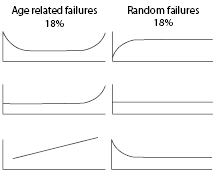 The ‘bathtub curve’ at the top of the graphic for equipment failure patterns is a prime example often taught to new reliability engineers. But, multiple reliability studies (starting with Reliability Centred Maintenance by Nowlan and Heap in 1978) have shown that only 18% of assets have an age-related failure pattern. Preventive maintenance is effective for only this small portion of assets. The other 82% of assets have a random failure pattern with no rise in failure rate. Another approach is needed for the other 82%. Reactive field service with IIoT and remote monitoring. Critical assets, both new and existing, often have a high degree of technical sophistication. This makes it increasingly difficult to isolate and identify problems. As equipment gains complexity, it becomes impractical for a general-purpose maintenance team at the end customer’s site to support and maintain (compared to the time when cars had carburettors and no computers, few people repair their cars – the author included). One response is to provide the technician with deep product training. Unfortunately, the training knowledge decays or leaves for another role before the next repair. • Automation: mechanical controls that could be observed have given way to electronics, mechatronics, software, and networking with interaction among the sub-systems. The technician’s eyes and ears alone are no longer sufficient to identify and resolve impending problems. Debugging and problem isolation requires specialised training and tools. • Intellectual property: R&D involves science and computer-aided design (CAD) software to optimise equipment performance. Adjustments made by a general-purpose technician can be counterproductive (long gone are the days when you could tune your car by making carburettor adjustments until it sounded right). This trend of increasing asset complexity is driving the outsourcing of maintenance to the equipment supplier. Much like for your car, routine maintenance like oil, tyres, battery, muffler and brake replacement can be done by an independent repair shop (which would be analogous to the on-site, general-purpose maintenance staff). But, more involved diagnosis and repair of the engine, transmission and electrical systems requires the deep training and proprietary equipment in the dealer’s service centre (analogous to the equipment manufacturer or a specialised service provider). 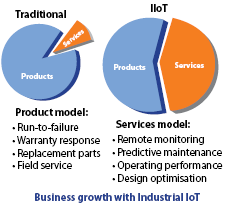 Industrial IoT (IIoT)-enabled condition monitoring and predictive maintenance approaches allow manufacturers to consider outsourcing to the OEM or a specialty service provider. Now, with remote asset health monitoring using IIoT and analytics, service providers can obtain warning of an impending failure and provide repairs to reduce unplanned downtime to near-zero levels. The OEM or specialty service provider has an intimate understanding of the operating performance of the equipment. This often enables it to develop algorithms for successful early detection of issues – sometimes up to six months prior to failures. With this advanced notice, the service provider can either alert the end user or schedule repair with its own field service technician. In the latter case, the technician’s deep understanding of equipment performance and repair knowledge typically translate into a higher first-time fix rate (FTFR) and longer mean time between failure (MTBF) compared to work by on-site, general-purpose technicians. Without IIoT and remote asset health monitoring, it was previously often impractical for the OEM to maintain critical equipment. When the equipment failed, the OEM or its local dealer would be called with an urgent request for a technician. The first field service visit typically becomes an inspection to assess the problem and determine the needed parts, tools and skills. A second field service visit is needed for the repair. With two service calls, the unplanned downtime could easily extend for multiple weeks. For most equipment, this is unacceptable. Using remote asset health monitoring services for predictive maintenance (PdM), the service provider can identify and repair the problem before unplanned downtime occurs. The proactive repair and high FTFR avoids lost revenues for the manufacturer. This improves customer satisfaction at the executive level with high likelihood of repeat sales. Elevator manufacturers have told ARC their FTFR rose from 65 percent to over 90 percent using IIoT and PdM. Field service involves widely distributed assets. 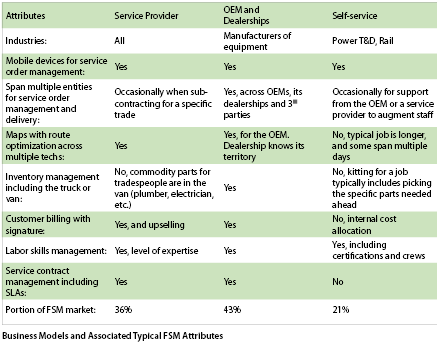 Service providers use FSM solutions to deliver maintenance services to asset owner-operators. FSM systems plan, optimise, execute, and track the needed service activities with the associated priorities, skills, materials, tools, and information. The field service business processes involve several functions within a company and many stakeholders. By adopting modern IoT and cloud technologies, nearly every aspect of the business process for condition monitoring, triage and servicing equipment can be automated. Analytics can take the form of first principle engineering models, machine learning, or both to generate an alert that provides advanced warning of the failure. A modern FSM application supports technician scheduling and route optimisation. OEMs tell ARC that 30% or more of the repairs can be made via the web by modifying parameters remotely or through guided assistance of an onsite person. IIoT and the business process automation make both the cost and speed of maintenance by a service provider rather than an on-site technician more attractive. Consider the combination of remote monitoring, alerts prior to failure, schedule optimisation, one-pass repair, high FTFR, faster mean-time-to-repair (MTTR), and a significant portion of repairs occurring without a service call. Meanwhile, equipment continues to become more complex and a large portion of experienced technicians are retiring. • OEM (providing after-market services for equipment it produced). • Service provider (maintaining other companies’ assets). • Self-service (maintaining widely distributed assets by the owner). The IIoT provides the means to monitor equipment health and its performance in the plant. Using IIoT, analytics and predictive maintenance, OEMs deliver condition monitoring services that provide near-zero downtime. This provides customers with clear business benefits for revenue, quality and on-time shipments. Currently, the most common application of the IIoT involves selling after-market services for asset health monitoring to reduce unplanned downtime, improve reliability, and extend asset longevity. The IIoT also offers the ability to deliver a more holistic view of the customer experience beyond failure prevention. More recently, OEMs have expanded this service to include guidance for improving the operating performance. OEMs that can provide predictive maintenance aftermarket services successfully gain a new high-margin revenue stream and improved customer satisfaction with a higher ‘net promoter score’ (a customer loyalty metric) that drives repeat orders. ARC expects high growth in maintenance outsourcing as these technologies continue to mature with broader adoption of remote equipment condition monitoring. To execute on the promise of ‘near-zero unplanned down-time’, the business processes need to include the scheduling of a technician to do the repair. Most OEMs have a dealer network that sells and services the equipment. Since the technicians are part of the dealership, that business must be included in the programme. The dealership will need to be involved in processes to qualify skills, support ongoing training, execute service, track compliance, and update the business agreement. In the past, many equipment manufacturers ceded service and the customer experience to their dealers and distributors. Today, manufacturers are reclaiming that service relationship through a modern field service management system and remote monitoring. Adding IoT to their products provides the infrastructure for predictive maintenance and proactive service. Rather than react to emergency calls and disgruntled customers, they know when equipment health is deteriorating and perform the repair prior to failure. Service providers – particularly those focused on a type of equipment like HVAC – can provide a similar digital transformation by enhancing their service agreements with add-on components for remote monitoring and predictive maintenance of the equipment. By combining machine data from IoT-connected products and artificial intelligence, manufacturers can power truly intelligent service experiences for customers. They can also personalise the service experience better and provide guidance for operators by understanding on a granular level how their customers use their products. Unplanned downtime is particularly painful with lost revenues, missed customer shipments, quality issues, and safety or environmental incidents. By nearly eliminating unplanned downtime, customer satisfaction, net promoter score, and repeat orders increase. This capability enables a market discontinuity (a change in market shares and ranking) among industrial equipment suppliers and service providers. Obviously, industrial end users stand to gain significant benefits as well.